Install a slab pier system that connects the slab to stable soil or bedrock. Once installed, the system makes it possible to re-level settled slab sections. Raise settled concrete using PolyLevel® expanding foam. Injecting this high-density foam beneath the slab will fill voids and consolidate weak soil while also raising settled slabs back to their original position. Learn more about concrete leveling and what makes PolyLevel® an effective concrete repair solution. Your foundation repair experts will use that proposal to map out the locations where the slab piers will be installed. At the beginning of each slab pier installation, a small hole is cored through your concrete slab floor. This hole will create an access point for the slab piers that are about to be installed. These steel tubes are the real strength of the foundation pier system -- and are responsible for transferring the home weight to strong supporting soils. To prevent corrosion, Supportworks has slab piers available that are designed using galvanized steel. This ensures the quality and long-lasting strength of your slab pier system. As the system lifts your concrete slab floor upwards, the sinking movement of your floor will be permanently halted. Often, it will also be possible to lift the concrete slab back to a level position. At DBS, we take pride in leaving your home looking clean and neat. Once the installation is completed, we repair all cored holes with concrete, making your final installation virtually invisible. A concrete slab being jackhammered and removed during a floor replacement in Saginaw. A typical replacement can take several weeks to complete. To perform a job like this, all home furnishings, floor coverings, and interior walls must be removed. Then a crew jackhammers the existing floor into small pieces and removes them by hand. Once this is complete, a new floor is poured and the homeowner must allow two weeks for the grout to cure sufficiently. The interior partition may be rebuilt, floor coverings may be reinstalled, and home furnishings may be returned. While this situation is disruptive and expensive, the real problem here is that the issue that caused the problem in the first place has not been addressed. Without addressing the soil problems that lead to the floor cracks, your new floor may "break" over time too! However, if the floor wasn't prepared properly, the grout may not bond well to the surface of the slab, leading to chunks of it breaking off. Additionally, the grout will add weight to the slab, potentially making the situation worse by causing further settlement. And, just like with the last two options, the real problem of soil settlement is not addressed! Looking For Foundation Slab Repair Contractors In MN and WI? 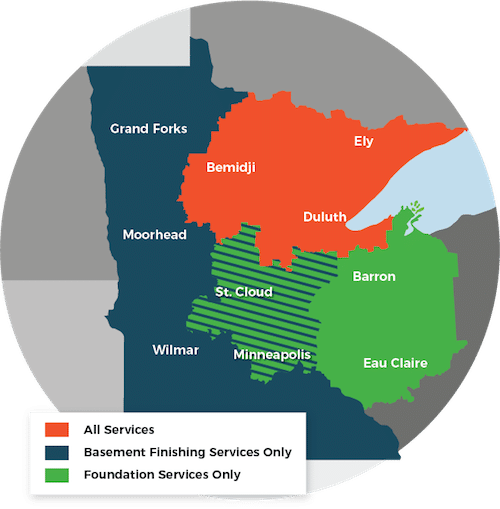 At DBS, we provide proven solutions for concrete slab floor leveling -- as well as other foundation repair solutions -- to homeowners throughout Minnesota and Wisconsin. We provide each of our customers with a free, no obligation slab repair quote, in writing, before any work is done. To schedule your appointment, call or e-mail us today!